I made it safe and sound through two days of toddlers, and 25 hours in the car/on the road. Too tired to talk about it right now, though... Understandably, right???? Ohhhh I love that square bear!!!! Those little stubby arms & legs are soooooo cute! I am glad to hear that you are back safe & sound. Looking forward to hearing all about it! Nice to meet you Mr. Square Bear. You look like a handful of sweetness! what a darling! can't wait to read more about your mysterious trip to our nation's capital. is it one of those things wherein you could tell us, but would have to kill us? I think the best thing about him is his choice of reading. it is nice to have you back. and omg, he's so cute. It's great to see a little knitted creatures that escaped from your own imagination. Do you remember telling me once that you like people who are interesting a lot more than you like people who are nice? Well, something about that little bear makes me think she is, oh, so much more interesting than she is nice. I absolutely love her!! Sorry to speak up again so soon, but the title of that book is cracking me up. Is it meant as a joke? I mean perfect children doen't have to be raised, they simply spring from the cabbage patch already perfectly perfect, right!?! How adorable! 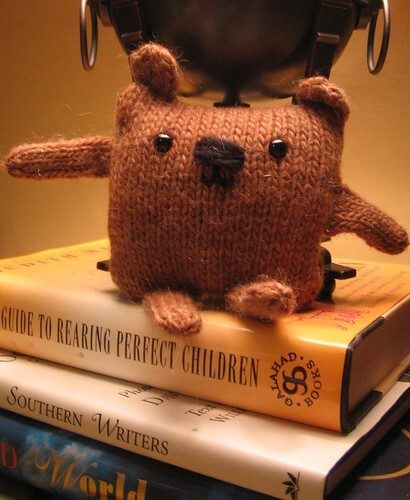 You've made me want to make my own small square bear or other square critter of some sort. As if I didn't already have enough projects. Grr.